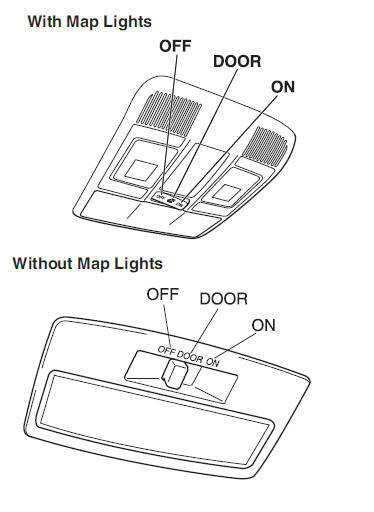 (With map lights) The rear overhead light also turn on and off when the front overhead light switch is operated. When the overhead light switch is in the door or off position, press the lens to illuminate the map lights, and then press the lens again to turn them off. The overhead light switch is in the ON position. The overhead light switch is in the door position with the door open. The illuminated entry system is on. The boot light is on when the lid is open and off when it's closed. To prevent the battery from being discharged, do not leave the boot open for a long period when the engine is not running. The overhead lights turn on when any of the following operations is done with the overhead light switch in the DOOR position and the ignition switched off. Turn on for about 30 seconds when the driver's door is unlocked. Turn on for about 15 seconds when a door is opened with a key left in the vehicle and then the door is closed. Turn on for about 5 seconds when a door is opened from the outside with a key being carried and then the door is closed. The overhead lights turn on for about 15 seconds when the ignition is switched off with the overhead light switch in the DOOR position. 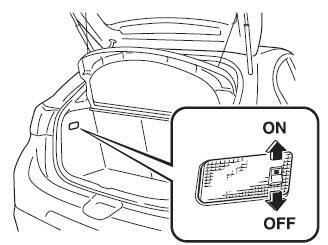 If any door is left open with the overhead light switch in the DOOR position, or the liftgate/boot lid is left open, the overhead light or luggage compartment light/boot light turns off after about 30 minutes to prevent battery depletion. No operations are done for about 30 minutes after the ignition is switched off. When the LOCK button on the key is pressed or the request switch is pressed to lock the doors on vehicles with the advanced keyless function after the ignition is switched off (interior lights turn off a few seconds). 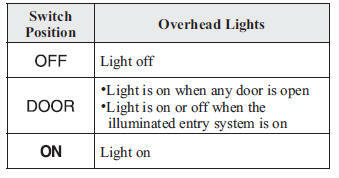 In addition, if the following operations are performed after turning the interior lights off, they will turn on again. The ignition is switched to a position other than OFF.